I have owned a Baby Jogger City Elite double for the last 17 months and it has to be my absolute favourite pram that i have ever used. 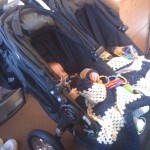 It is a deluxe double pram with beautifully padded near flat recline seats which have a vented mesh recline and roll away all weather cover.There is a raised kicker on each seat which not only makes the seat units more comfy for a baby but also allow access to the shopping basket from the front. It also has Baby Joggers patented quick fold technology, which makes folding this pushchair a breeze.New foam filled tyres all round make it a very comfortable puncture free ride. All wheels are quick release which make it easy to foldthis up pretty small. There are 2 very large hoods which pretty much eliminate the need for sun shades as they cover really well. Each hood has 2 peekaboo windows (1 on each setting) which have magnetic catches so dont distrub a sleeping baby with ripping velcro, And also a vented window ont he side of each hood covered with a magnetic cover. The Baby Jogger City Elite has a universal accessory mounting bracket which allows for the attachment of the full width belly bar. 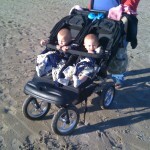 Unlike the Baby Jogger City Mini Double it is NOT suitable for use with the new 2011 carrycots sadly. Fully adjustable rubber handle bar which will accomodate most parents needs. There is also a 12 pocket multi function parent console which is invaluable for kids juice cups, parents drink, phone, keys, money etc etc etc. Each of the seat has a large seat back full length mesh pocket. These are idea for popping in the kids coats, a blanket or 2, small pouch with changing bits in or anything you like. Limited accessibilty to them on full recline. New models have hand operated brake where as i had the old foot brake on mine which was perfectly fine for me. Under the left seat there is a vecro storage strap which will hold your pram shut once folded. It will take a combined weight of 100lbs. 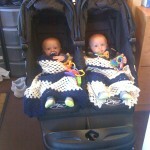 I also have 6.5 yr old twins whose combined weight is about 100lbs and they still fit in the Elite with room to spare!!! Overall width is a very respectable 75cms. I never found a door i couldnt get through with this- even my front door! Final thoughts- The Baby Jogger City Elite double is a fantastic all terrain double pushchair with large coverall hoods,that is capable of managing a tiny baby right through to a large toddler. Very well thoguht out with lots of great and unique features.